CLEARWATER, Fla. — The crowd that gathered Wednesday morning peered to the sky as the baseball towered over Spectrum Field, the victim of a majestic Bryce Harper swing. The home run cleared the wall in right, soared over the grass berm, and went past the concourse before leaving the ballpark. This — an up-close encounter of Harper — was why the crowd had gathered. Harper, facing live pitching for the first time since last season, took just a handful of swings in a simulated game against Jerad Eickhoff. He will play another simulated game on Thursday before making his Grapefruit League debut on Saturday as the designated hitter. Those few swings on Wednesday were enough as Harper mashed a curveball with such authority that its hangtime to right field provided enough time to dream about what Harper could do this season in 81 home games at Citizens Bank Park, which has the same hitter-friendly dimensions as Spectrum Field. Harper, in 50 games with the Nationals, hit more homers (14) at Citizens Bank Park than he did at any other visiting stadium. His .930 OPS in South Philly is the fourth highest in the 15-year history of the ballpark among all players — Phillies and visitors — who have played at least 50 games at CBP. The Phillies have not had a lefthanded hitter hit 30 homers since Ryan Howard in 2011 as they have failed to take advantage of the 330-foot wall in right field. Of his career homers, 60 percent have been to right field. 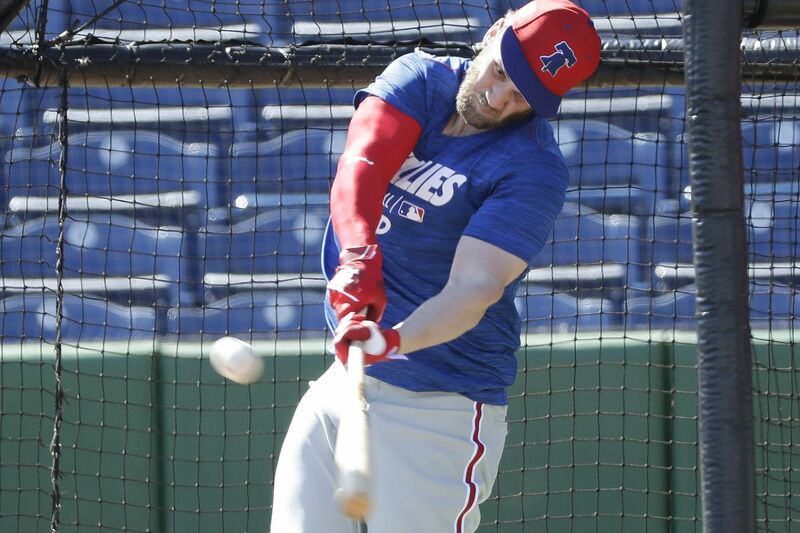 Harper, just like Jim Thome and Ryan Howard, seems to be built to hit at Citizens Bank Park. If you’re sitting in right field this summer, beware. Austin Listi went 2 for 2 and Gregorio Petit drove in two runs as the Phillies fell to the Blue Jays, 9-7. The Phillies will play the Yankees at home on Thursday and travel to Lakeland to play the Tigers in a split-squad. Drew Anderson will face the Yankees and JoJo Romero will face the Tigers.